Barite is one amongst the foremost common and high usage mineral with BaSO4 general formula that our company exporting this with any varied grads, density, meshing and different specification special for some works like gas and oil drilling, medical and cosmetics, civil and constructions, fluidizing, barium chemicals, ceramics and plenty different fields that mention in flowing. However, our most exportation refers to drilling barite that uses to creating drilling fluid. Barite with expanded applications, also has high rang of variety which any of them, has special usage in different businesses which all of them supporting by ATDM company. This mineral generally separated in two branches crystal and drilling and they are different in meshing, density, hard nesses, and amounting of iron powder and etc items. also this mineral is available in meshing 200 to 2000, different densities between 1 to 4.5, different hardness and strong certifying like API or OCMA. Barite by ATDM company exporting to all over the world with every type of packing referring to customer request. Also our packing involves expanded types like 15 kg plastic bag over wooden pallet until 1.5 ton jumbo bag which all of them guaranteed the safety of order and make transfer and shipment easy. Since this mineral has high density compare to other non-metallic materials, generally transfer by vessel and it is ready to loading and sending from different harbors to everywhere in the world and according to climate of destination, refers to packing type, it can be resist high temperature till 500 Fahrenheit degrees. 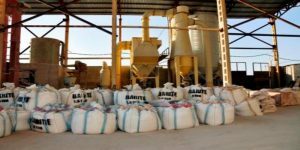 Barite mostly uses for gas and oil wells drilling somehow that ¾ of all this mineral uses for this way and also one of our basic goods, is mineral. However it has a lot of other applications like: making paper, rubber manufacturing and resin, textile, ink making, plastics, TV lamps, cupper oxygenating, X-ray lamp, brakes pads, car pile, crystal, X-ray and gamma absorbent and lots of other fields that our company manufacture and supply them to the universal market. Barite usually happens as concretions and void-filling crystals in sediments and substance rocks. it’s particularly common as concretions and vein fillings in rock and dolostone. wherever these carbonate rock units are heavily weathered, massive accumulations of barite are generally found at the soil-bedrock contact. several of the commercial barite mines manufacture from these residual deposits. Barite is additionally found as concretions in sand and sandstone. These concretions grow as barite crystallizes among the opening areas between sand grains. generally, crystals of barite grow into attention-grabbing shapes among the sand. These structures are referred to as (barite roses). they will be up to many inches long and incorporate massive numbers of sand grains. often barite is thus plentiful in an exceedingly arenaceous rock that it is the (cement) for the rock. Barite is additionally a typical mineral in hydrothermal veins and may be a gangue mineral related to sulfide ore veins. it’s found in association with ores of antimony, cobalt, copper, lead, manganese, and silver. during a few locations’ barite is deposited as a mold at hot springs.